In a bowl, pour oil and honey over pumpkin. Toss well. Place in an ovenproof dish and season with salt and pepper. Cover loosely with a piece of foil and roast for 40 minutes. Remove foil and bake for a further 20 minutes, or until pumpkin is golden. 210 members have added this recipe to their cookbook. I put too much pepper and replaced honey with silan. Turned out great! My wife grabbed some. 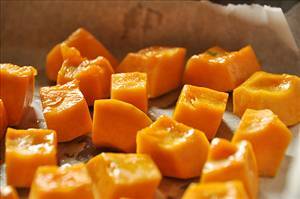 I would skip the honey,use butternut squash, add onions, and root vegetables to bring out natural sweetness. Also sprinkle spices like Cardamom, nutmeg, cinnamon. There are 46 calories in 1 serving of Honey Roasted Pumpkin. Calorie break-down: 42% fat, 54% carbs, 5% protein.